Bicycling has become a mainstream way for many New Yorkers to commute to work and travel around the city. It’s inexpensive, it promotes public health, and it’s a key part of helping the city respond to climate change. Right now, the city’s goal is to increase bicycling to 3 percent of all trips by 2020. 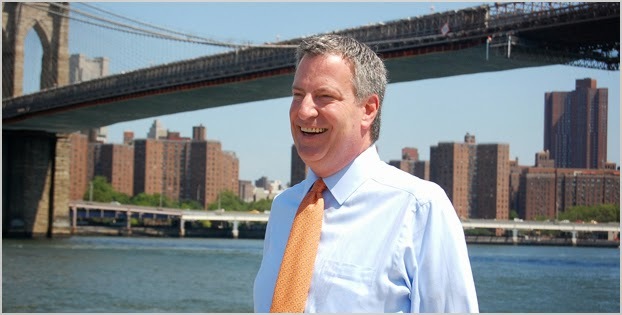 Bill de Blasio will double that goal—using education, promotion and safer streets to grow bicycling to 6 percent by 2020. De Blasio will continue expanding bike lanes around the city so that bicyclists have a safe, dedicated space to ride—and drivers and pedestrians will have more predictable streets. He will expand the public Bike Share program to outer-borough neighborhoods and increase education outreach to promote safe riding. With these tools, de Blasio will set a goal of cutting serious cycling injuries and fatalities in half — even as the number of cyclist continues to grow. De Blasio believes strongly that communities deserve a voice in decisions that affect them—and this includes bike lanes. As mayor, de Blasio will expand communication before street changes are installed by notifying residents and small businesses through the distribution of fliers and door-to-door outreach. He will work to address their feedback before projects are installed. By better communicating on the front end, de Blasio will reduce friction and bolster public support for expanding cycling in the city. And this guy is ahead of the curve in other ways too. 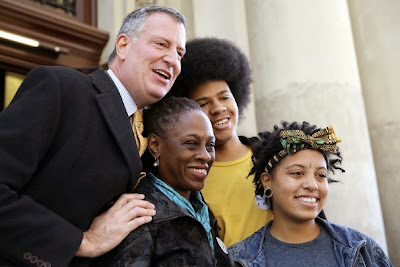 Besides having an inter-racial family, his wife, Chirlane McCray, a political strategist and speechwriter, helped him get elected..